Except for the back emf diodes across the relay coils this circuit is identical in function to the example shown on the relay contact labeling guide in the practical section. At first glance this may look over-complicated, but this is simply because three non-latching push button switches are used. When the forward button is pressed and released the motor will run continuously in one direction. The Stop button must be used before pressing the reverse button. The reverse button will cause the motor to run continuously in the opposite direction, or until the stop button is used. 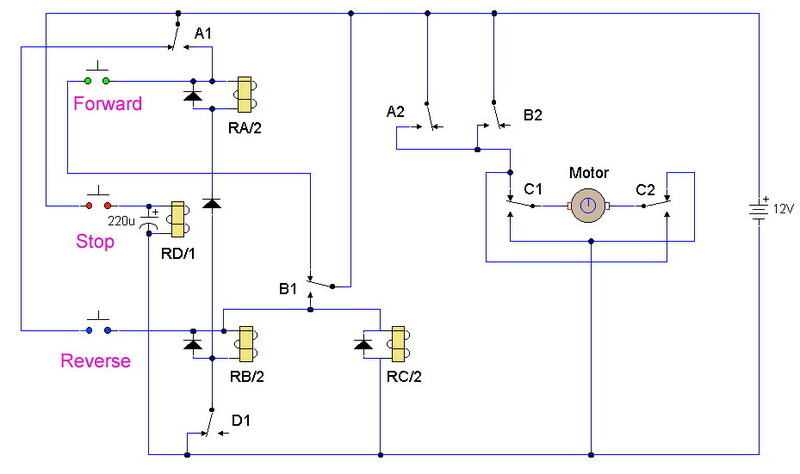 Putting a motor straight into reverse would be quite dangerous, because when running a motor develops a back emf voltage which would add to current flow in the opposite direction and probably cause arcing of the relay contacts. This circuit has a built-in safeguard against that condition. In the original circuit a diode was omitted, this is the diode now in series with relay coils RA and RD. Special thanks to Christian Sanchez from Ecuador for pointing this mistake out. 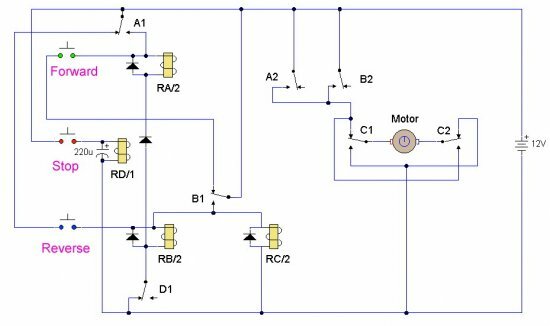 Without the diode relay RA remains energized, its holding current path is through relay coils RB and RC, the diode now breaks the path.